Good nutrition can help you get the most out of each workout to make your training program as effective as possible. If you use them right, protein drinks after an exercise session can promote muscle repair and speed up glycogen replenishment so that you can recover from your workout faster. The best protein recovery drinks provide other essential nutrients, and they are healthiest as part of a balanced diet. Consult your physician before taking any supplements. The best protein drink for replenishing your stores of glycogen, which fuels your muscles, has a ratio of about 1 gram of protein to 5 grams of carbohydrate, according to the Gatorade Sports Science Institute. Try to get 7 to 10 grams protein within 30 minutes of finishing your exercise, according to Iowa State University. Within 1 to 2 hours after your workout, drink a protein recovery drink with up to 20 grams protein. More than that amount at one time does not have additional benefits for muscle recovery. 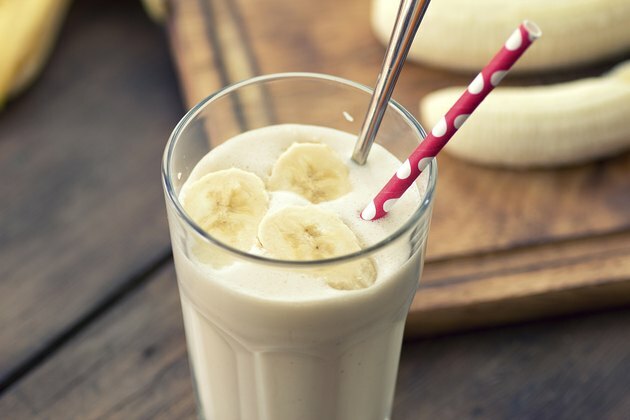 The best protein recovery drink provides high-quality, or complete, protein, which means that it has each of the essential amino acids you need to get from the diet, according to Iowa State University. All animal-derived proteins are complete, and common ingredients in protein recovery drinks are milk proteins, such as whey or casein. Soy protein is a complete, plant-based protein, and you may want a protein recovery drink with soy protein if you are strict vegetarian or vegan. The best protein recovery drink for you tastes good, and common flavors are chocolate, vanilla, cookies and cream and strawberry. A ready-to-drink recovery drink, such as in a single-serving can or bottle, may be the most convenient post-workout option if you are going to be in a rush. A powder may be better for long-term storage because it is more compact than a ready-to-drink product, and powders allow you to decide whether to mix them with water, juice, for a different flavor and more carbohydrates, or milk for more protein and calcium. The best protein recovery drink provides additional essential nutrients that may be inadequate in your diet, such as calcium or iron for women, or vitamin B-12 for strict vegetarians. Hydration is the primary concern throughout the day and immediately following a workout, and your protein recovery drink does not take the place of a fluid replacement beverage, such as water, according to Iowa State University. Also remember that your training program is far more influential in your athletic performance than which protein recovery drink you choose.